KUALA LUMPUR, Feb 24 (Bernama) — Datuk Seri Najib Tun Razak today said Selangor will be more progressive if administered by the Barisan Nasional (BN) because many problems in the state could be resolved. The Prime Minister said with Selangor becoming more progressive, Malaysia would be more successful. Towards this end, Najib, who is also Selangor BN election director, said the BN government could not leave Selangor to be administered by other parties as the state was important for the nation’s future. “Selangor is far too important where the nation’s future is concerned…we cannot have a situation where Selangor is governed by one party and the central government by another. “There are too many problems in Selangor (now) because the party in control (in the state) is not the same as the party in charge of the federal government,” he said at a Chap Goh Meh celebration organised by Selangor BN at Sekolah Kebangsaan Pandan Indah here. As such, Najib urged the people of Selangor to put an end to their “suffering” by returning the mandate to the BN in the upcoming general election. “If the people of Selangor give the BN the mandate, we can form a new government, and retain the federal government with an even bigger majority. “I believe Selangor will be more progressive and Malaysia will be more successful. If the government has more powers, then many problems can be settled. As an example, he said, a memorandum calling for establishing a National-type Chinese school in the state constituency of Teratai under the parliamentary constituency of Pandan, might be resolved if power returned to the BN. “Land is under the control of state governments, but if we can be in power (in Selangor), many problems can be settled… I think you get the hint,” he said to loud applause from the guests. Despite heavy rain, approximately 10,000 Selangor citizens, especially from Pandan parliamentary constituency, flocked to the area to celebrate Chap Goh Mei with the prime minister and his wife, Datin Seri Rosmah Mansor. Najib said the event was the fifth for him today but the tiredness he felt disappeared upon seeing the presence and support from the people. “This shows that the concept of sharing has materialised. The people now accept, cherish and practise the cultures of other races. “This is what makes Malaysia special and unique…our diversified religions, races and cultures are not obstacles for us to create our success stories,” he said. 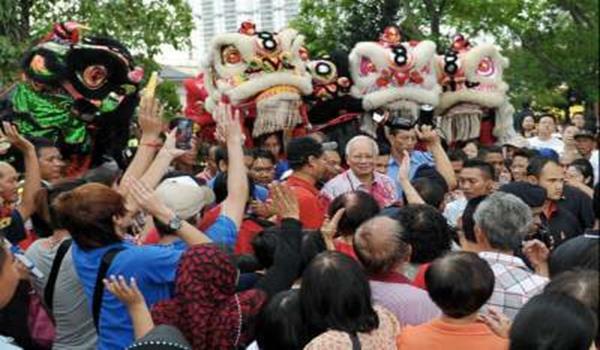 Commenting on the television advertisement showing him beating a Chinese drum for dragon dance troupes in conjunction with the Chinese New Year, Najib said it showed that he, as the prime minister, respected the culture of the Chinese community. Therefore, he said he would like the Chinese community to show mutual respect to the cultures of other races in the country. “When we have mutual respect, Malaysia will continue to enjoy peace and stability,” said Najib, who also hoped that the Year of the Snake would bring new blessings to all people. Meanwhile, Pandan Member of Parliament Datuk Seri Ong Tee Keat in his welcoming speech said this was Najib’s second visit to Pandan in a month. He said he hoped Najib’s concern for the people in Selangor, especially in Pandan, would be appreciated so that the people’s wellbeing would continue to be looked after in the country.